Home » Laser vein treatment » Think Laser Vein Treatment is Just for Your Legs? – Think Again! A common misconception is that laser vein treatment is only for spider and small varicose veins of the legs. The truth is that venous insufficiency issues can happen all over the body. Because of this, medical science has worked hard to perfect a laser so pinpointably accurate and gentle that it can be used in many locations throughout the body. This is not limited to legs and includes veins of the face, neck, chest, and delicate thigh area as well. While your legs may be fairly easy to cover (other than in Florida’s hot summer months), hiding your face, Chest, and neck can be tricky if not impossible, leaving you feeling self-conscious a lot of the time when interacting with others. Laser treatment fades small veins nearly anywhere on the body. It eliminates the old style need for surgical intervention. Many hold concerns that laser treatment will be painful. The truth is that the procedure is performed by using a localized anesthetic. 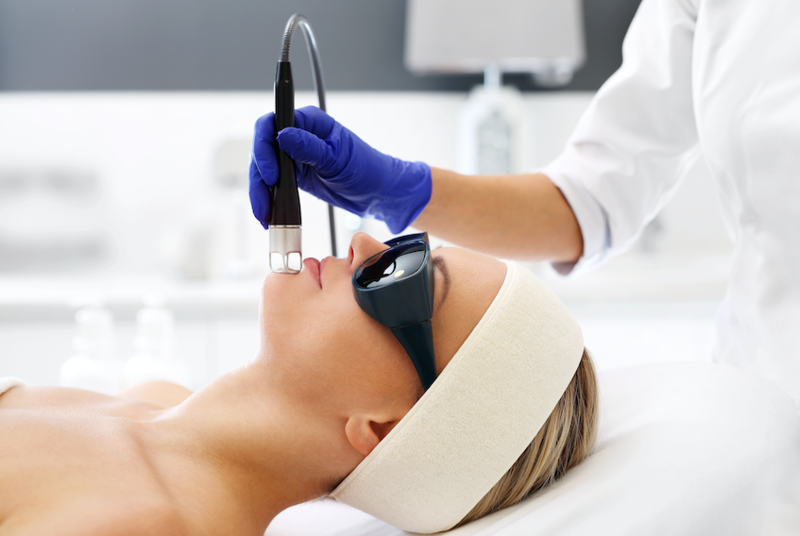 During the treatment, the laser emits short powerful bursts of energy which penetrate the damaged vessel walls. This burst causes them to collapse and the body to reabsorb them so that they dissolve and no longer exist. The sensation of the laser is comparable to someone snapping you with a rubber band directly on your skin. Most find that short sessions are very easy to take an even longer session for larger areas, though the feeling can be annoying, it’s not enough to elicit a pain reaction. Though some smaller areas may take only one session to get the results desired, other larger or deeper areas may require follow up. Treatment is fast, safe, and effective for all benign vascular issues. Patients may experience slight discoloration following the procedure. It generally subsides within 1-3 days following. We highly recommend wearing a sunscreen of at least 30 SPF (Sun Protection Factor) and limiting direct sun exposure during the healing time for best results. While results and healing times vary for everyone, most everyone reports decreased redness and faded veins within just a few weeks following treatment. Please contact Dr. Mark Zuzga of The West Florida Vein Center of Safety Harbor / Tampa, Florida for more information or to schedule an appointment for a consultation. At that time you will be diagnosed and given the very best options available for your individual case.